Canon Rebel T3i vs T4i Comparison, What's the Difference? Home / Digital Camera Comparison / Canon Rebel T3i vs T4i Comparison, What’s the Difference? In fact, the most important specifications, such as the 18MP CMOS sensor, 9-point AF sensor, 3 “screen with 1,040,000 PX , seen in the T3i are also present verbatim in the T4i. Looking at it more closely; however, we realize that in fact there have been some significant improvements, such as continuous AF during movie recording, made possible by the new “Hybrid CMOS” Canon sensor, which now includes pixels devoted to phase detection. In a nutshell, the hybrid AF system is able to pass from the contrast detection system to automatically Phase: In theory, when the subject is positioned in the center of the frame, it takes advantage of the capabilities of the detection phase and then moves on to the system, in contrast to when the subject moves from the central area. The older Canon relies instead on traditional phase detection (CDAF – Contrast Detection Auto Focus). The Rebel T4i also becomes the first camera ever to have a touchscreen LCD display. The system is capacitive, sensitive to finger pressure, it behaves like that of a typical smartphone. In Live View and video modes, the screen can be used to specify the point of focus and also take the picture. The back of the screen has been redesigned, eliminating the air gap between the display and the cover glass in an attempt to reduce glare and enhance visibility in bright sunlight. On the screen, there is also a special coating to resist stains which aims to reduce footprints and always ensure good sensitivity. The Canon Rebel T4i uses the latest generation DIGIC 5 processor that enables you to increase the ISO sensitivity range from 12,800 to 25,600, it also allows for the correction of chromatic aberration in the JPEG to give a clear image. The autofocus system is borrowed from the EOS 60D, using a nine-point focus across all cross-types with a central point that provides additional precision with fast aperture lenses. The rear screen has been improved by reducing glare and maximizing visibility in bright ambient light. The screen is also equipped with anti-stain to always ensure excellent touch sensitivity. The camera also gains an internal microphone optimized to provide stereo sound during video shooting, along with an improved control layout that makes commands for motion picture recording more accessible. The Rebel T4i keeps the external microphone jack, as in the T3i, if you have the need for a better sound than the internal microphone. There are also a couple of new scene modes: Backlight HDR, and the Handheld Night, the first manages the backlight with the HDR function, while the second allows shooting night freehand. There are also several creativity filters Marked as Art and Watercolor. The Scene Intelligent Auto mode analyzes the scene that you are shooting and automatically selects the best settings, very useful for novice photographers. The body of the Rebel T4i is based on the same design as the Rebel T3i, the changes are almost minimal. The body is made of plastic, but the camera looks and feels pretty solid, the grip is slightly wider, a marked improvement over previous models of the same line. In the first picture above you can see how the T4i comes fitted with the new EF 40 f/2.8 STM pancakes. Despite being “entry level”, the T4i is surrounded by buttons and knobs, almost every part of the body surface is left blank. In the camera there are also USB and HDMI ports, along with a socket for an external microphone and infrared receiver. The big news, of course, is that the Rebel T4i becomes the first DSLR to offer a touch-sensitive screen (touchscreen). Well positioned, large icons allow you to adjust shooting settings, scroll through images and zoom, acquire the focusing in live view and press the shutter button. You can also browse the entire menu with the touch of a finger. The Canon Rebel T4i retains a good deal of interesting features from the Rebel T3i: very good image quality from an 18MP CMOS sensor, a good balance between detail and noise reduction in JPEG, good video capabilities and a very competitive price. Additionally, the new model carries significant improvements that make it much more modern than its predecessor, such as the touchscreen interface, a shutter speed of less than 5 fps, ISO sensitivity of up to 25,600, continuous AF mode video, in short, this is a camera that attracts both novice and more experienced photographers. I was, however, disappointed by the AF performance in live view: continuous AF in movie mode is too error-prone to focus. The performance of AF are still very small compared to that of some models of the mirrorless Nikos. These disappointing results in live view also raise real concerns for the arrival of the first Canon mirrorless camera (EOS-M), which is based largely on the T4i. It must be said that in optimal light, focus of the Rebel T4i is almost two times faster than the focus of the T3i. My final judgment on the Canon Rebel T4i is positive; I recommend buying, especially for photographers who want to enter the world of SLR for the first time. If you already have the D600, the new updates will be greatly appreciated and provide great incentive to purchase, further aided by the competitive price. Previous Canon EOS 60D vs 7D Comparison, What’s the Difference? 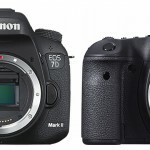 Canon EOS 7D Mark ii vs 6D Comparison, what’s the difference?